When an evil professor kidnaps someone you care about, you’re tossed into a wacky world of shifting perspectives and labyrinthine lanes that literally turn your world upside down! Get ready for some high-energy hijinx because this Action/Arcade game is like none other! 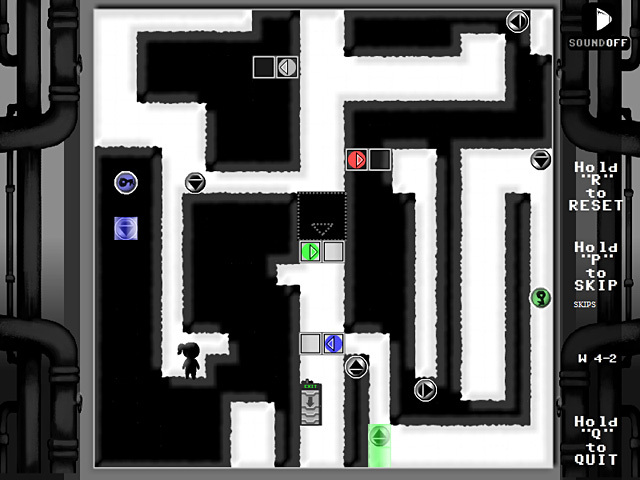 Outsmart that pesky professor and make it passed his menacing maze in Alt Shift! 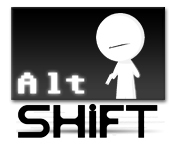 AltSHIFT is rated 4.4 out of 5 by 5. Rated 5 out of 5 by Hairboy from Totally Different I've bought a few dozen games on BigFish, and they're all really just variations on a theme. But this one comes from it's own unique mould. I can't think of another game that's similar! Lots of brainbending puzzles, and one that will keep you puzzling and trying solution after solution for many hours. Loved every minute! Play the free hour, and I challenge you to not want more! Rated 4 out of 5 by Moswen from Black and white platform - decent challenge A platform game where each level is a puzzle to figure out how to get to the exit. Sounds simple? Hohoho, think again. The levels are interspersed with quirky and light humored comic strip story line and alternative puzzle challenges. Story: A mad professor has kidnapped a couple and separated them, and they have to make their way through all the mazes and pipes of the factory to vanquish the Prof, in order to reunite with their lost loooooove..... Feel of game: Sounds and music match the late 80s/ early 90s feel of the graphics, and game play is deceptively simple and enjoyable. The simple black and white motif of the game elicits an interesting comment at the end of the game (You'll see!) Game play: - You get to choose if you want to male / female. - You get to skip up to 3 times if you want and can re-do any of them to recoup that "skip" if you want to use it elsewhere - You can re-do levels at any time - Completing the game unlocks new puzzles, of platform and alternative puzzle variety. 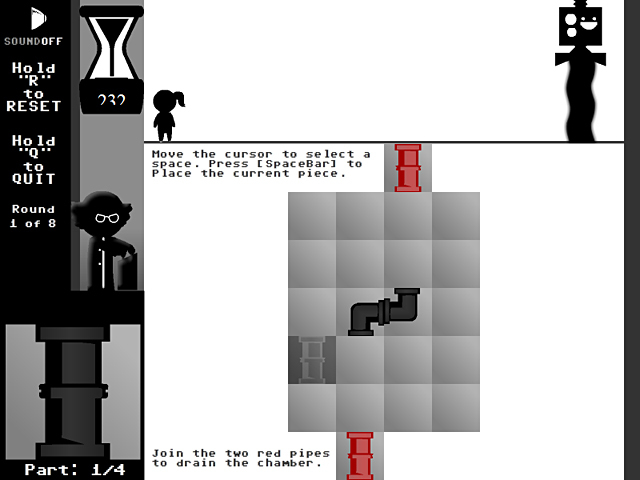 Platform puzzles: Figure out how to get to the exit. Sounds simple and dull. But that is not always the case, and you get sucked in. There are some very simple puzzles, and also some puzzles which make you want to pound your head against the wall to help try figure it out. (Very satisfying when you do though!) It is for this reason I am giving a very good overall 4* score, for balancing and introducing difficulty at a good rate in the game. In the "rock" hard puzzles I unlocked _after_ completing the game, I am and hour into still tryng to figure out the first one, but happy go keep pecking away at it. It is indeed 'rock' hard, and harder than the levels in the core game. 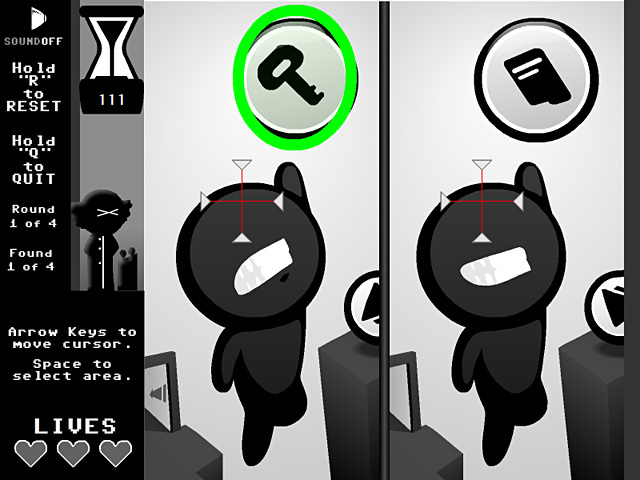 :) In the game, you turn the screen upside down or 90 degrees by touching various panels in the game, or invert the screen by choice as part of the game. The first few levels help you get the hang on controls which are pretty simple and classic options: arrows and space, or ASDW and space. So you can be hands-on the keyboard. For me, this game engaged the same part of my brain which I used when playing the PS3 game Portal i.e. "If I am upside down, but I jump here, then I could be here and here, to do blah blah..." Where sometimes your brain hurts and you go ahead and take a blind leap of faith to see where you end up, and sometimes become very happy with the end result, or have to press R to reset because you have blocked yourself from other moves. The alternative puzzles: Spot the difference, Sliding blocks, Pipe fitting - Easier than the platform parts of the game and a welcome brain refresher. Quite fun! In the main game, these are timed. In the unlocked challenges, they are not. Summary: If you like platform games that are a "medium - sometimes hard-ish difficulty", and figuring puzzles out relating to gravity and inverting your environment - then you will enjoy this for sure. Rated 3 out of 5 by mrm2006 from Use the Keyboard NOT your Mouse! The storyline of this game was .... okay. Space odyssey gone wrong. The graphics, IMO, were horrible. Black and white only? When was this game developed? It offered NOTHING to the game to make it interesting OR entertaining. I cannot comment on the music/sound fx because I had it turned down (puppy sleeping). The gist of the game is to get to the "exit" by overcoming obstacles, such as a bed of spikes you don't want to fall in .... or you lose a life. Much like the original Mario Brothers game. I found too much wrong with this game .... for me. It was black and white ......... BORING! You COULD choose male or female role BUT there is NO profile to add your name. So, only one person at a time can play? No "options". Mario Brothers type of game play - it's been done and redone. Nothing new here. So, not very entertaining. You use your mouse to start the game but you have no choice but to use the keyboard or arrows to PLAY the game. Sorry, but that just DOES NOT work for me. For all these reasons, and several more, this game is not for me and not a purchase. Do I recommend it? Sure, it's an hour demo. It just might be for you. ENJOY! Enter a wacky world of shifting perspectives and labyrinthine lanes that will literally turn your world upside down!